Saying I love you - Je t'aime - is just one way to express love. There are also many love phrases to help you express your feelings in French. Don't forget to respond, "Je t'aime aussi!" - "I love you, too!" - lest your beloved go unrequited! The French verb "to love" is aimer. It comes from the Latin word amor, which is the basis for many words in Romance (Latin) based languages relating to love. Many French words for love - aimer, l'amour, j'adore - all take their root word from amor. It may be helpful to have the present tense conjugations of this verb on hand when looking at French words and phrases for love. As you know from studying grammar in English and French, there are many verb tenses, or ways to express time through verbs. The simple chart above expresses present tense only for the verb aimer; you may need to look up the other verb tenses if you need to use aimer differently. The verb aimer generally expresses romantic love. For serious moments between lovers, the simple, "Je t'aime" suffices. One may also say, "Je t'adore" to express adoration or passionate love for something or someone. In English, the connotation when using the adore is a much stronger desire or feeling of love; in French, it is less so. Just as we might say, "I love chocolate! ", the French also use the verb aimer to express love for things as well as people. It's perfectly acceptable to say, "J'aime le chocolat". And if you're a real chocoholic, you can indeed say, "J'adore le chocolat." 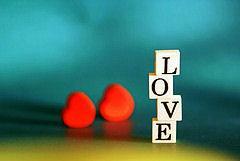 While the French word for the emotion of love is the verb aimer, the noun form of the word love is l'amour. Remember that French words use the designation le or la before the noun to indicate a masculine or feminine noun; the gender of the noun has nothing to do with the noun itself. A female cat, for example, would still be le chat. When the noun begins with a vowel, the le or la prefix is simply shortened to l'. To say "I'm in love with...()", you may use the phrase, "Je suis en amour avec...()"
There are some ways of expressing love and affection for someone in French that may strike the non-French speaker as peculiar. Calling someone a little cabbage, a hen, duck or kitten may seem absurd - but it's all a way to express love and affection in French. Whether you want to say that you love your partner or you just want to tell your new French friends that you love dancing so they invite you to go out with them to a local club, learning French words for love will help you express the desires of your heart.